Omega-3 fatty acids — or simply omega-3s — are an important topic in the nutrition industry. While that may sound like a new sorority to some, those in-the-know (like your doctor, and qualified nutritionists) assure can you that omega-3s are necessary for normal body function and optimal health. Basically, without these fats, your body would not be able to function normally, and you’d be more likely to develop a number of health issues. Make sure you include foods rich in omega-3s in your daily meals. There are few foods in our food supply that contain these beneficial fats, so it’s important to be mindful of your choices. As you can see, unless you’re eating a lot of seafood or often choose other foods rich in these fats, many of the foods that you probably eat regularly don’t contain enough (or any) EPA and DHA. You probably eat more foods rich in ALA. Unfortunately, even though ALA is an omega-3 fat, it doesn’t have as much functionality or offer as many benefits as EPA and DHA. We eat a lot of foods that contain ALA. These foods include soybean oil (found in most salad dressings and any food product containing vegetable oil), canola oil, and some nuts and seeds. Some people would argue that we do get enough omega-3s in our diets. However, ALA doesn’t have the same effects in your body as EPA and DHA. In scientific investigations, EPA and DHA are shown to be more effective than ALA for improving insulin sensitivity and glucose tolerance (which decreases your risk of diabetes), and are also associated with a lower number of deaths resulting from cardiovascular diseases (Anderson G et al, 2008; Breslow JL, 2006). EPA and DHA also help your central nervous system develop normally from infancy, and help prevent vision disorders like macular degeneration (Lee TK et al, 2010). Some people also claim that your body can make enough EPA and DHA from ALA, through special metabolic pathways in our body when we eat foods rich in ALA. That conversion process is rather insignificant, as the current scientific data suggests that only 5-10% of ALA is converted to EPA and 2-5% is converted to DHA (Brenna JT, 2002) within our bodies. To get the full benefits from omega-3 fats, you need to eat foods or take supplements (ideally a bit of both) containing EPA and/or DHA, in addition to consuming foods with naturally occurring ALA.
Pay close attention when looking for foods rich in omega-3 at the grocery store. There are products popping up every day, boasting about their “Heart Healthy Omega-3s.” If you look closely at the label, you’ll see that the source of the omega-3 is usually soybean oil or canola oil, and at such a small dose that it’s basically just bogus marketing. To make matters even worse, food manufacturers often load these “healthy” omega-3 foods with excessive amounts of sugar, which, I think we can all agree, we definitely don’t need more of in our diets. The best food sources of omega-3 EPA and DHA are dark, fattier fish, like salmon and trout. Unfortunately, this source of omega-3s is commonly avoided because not everyone likes fish or enjoys the smell, and some people have allergies. If you do like fish, aim to eat it at least twice a week in various forms (salmon sashimi anyone? Yes, please!). Fish is great for you—it’s high in protein and rich with beneficial fats. Be aware that some types of fish can have drawbacks. When you were a kid, your parents probably told you that fish was “brain food” and they were right! Fish is considered “brain food” because it contains our star omega-3 fats, EPA and DHA, which (as you learned above) are important for brain development, memory, and protection against neurocognitive disorders like Alzheimer’s disease. That being said, recently we’re learning that eating too much of some fish may be harmful to the brain. Though mercury is no longer used in that process, it still has the same effects in our bodies, albeit from other sources. One of the greatest sources of human mercury exposure today is from the consumption of fish. Some plants and animals also contain a bit of mercury due to bioaccumulation of mercury from the soil, water and air. 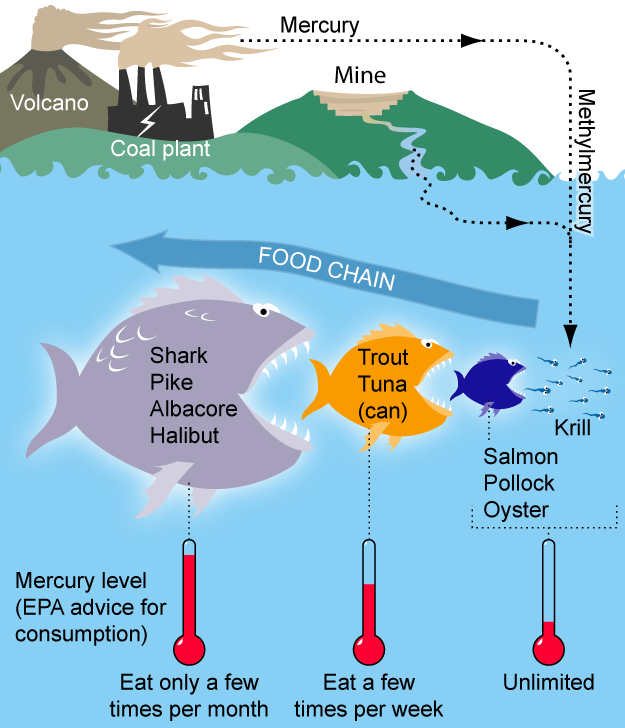 Fish contain mercury because the waters in which they swim in (our oceans, lakes, and streams) are polluted with mercury and other contaminates from common industrial processes, like coal plants and gold mining, and natural earth processes, like volcanoes. The fish, in turn, ingest the mercury and pollutants. Larger fish contain more, simply because they ingest smaller fish that also contain mercury. The chart below shows which fish are high, moderate, and low in mercury, so you can make the best decisions for your health. When possible, choose low-mercury fish and shellfish most often. Who Needs to Stay Away from Mercury? Pregnant women and young girls in America are advised to avoid eating fish with the highest levels of mercury contamination. In our country, this usually includes grouper, shark, swordfish, king mackerel and albacore tuna. They are also advised to limit their intake of fish containing lower mercury contents to no more than 12 ounces per week (canned light tuna, salmon, catfish), and check local advisories about the safety of fish caught in nearby lakes, rivers, and coastal areas. For pregnant women, the concern with mercury is that it easily crosses the placenta and goes right to the brain and nervous system of the developing fetus. This could lead to hazardous consequences. Children born to mothers exposed to high levels of mercury suffer from sensory impairment (vision, hearing, speech), disturbed sensation, and a lack of coordination. High mercury intake in children is also problematic. Symptoms of mercury toxicity to look for in children can include: red cheeks, nose, and lips; loss of hair, teeth, and nails; muscle weakness, and increased sensitivity to light. The Environmental Protection Agency, recognizing that children are more sensitive to mercury exposure than adults, developed the “Fish Kids” campaign to increase awareness of this preventable issue. Despite the warnings targeted at women and children, all of us need to be mindful of our mercury intake. This means that we should choose the lowest mercury-containing fish as often as possible, and eat higher mercury fish infrequently if at all. Eggs and Meat can deliver omega-3 fats too! Other than fish, there are other beneficial food sources of Omega-3 EPA and DHA, such as omega-3 DHA Eggs. These special eggs come from hens fed diets containing fishmeal or marine algae, which increases the amount of DHA in the yolk, and to a smaller extent, the amount of EPA. Regular consumption of Omega-3 enriched eggs is shown in research investigations to increase the EPA and DHA content of your blood, which helps prevent disease and disability (Smuts CM et al 2003). It’s important to read a package of omega-3 fortified eggs carefully. Make sure that DHA is specifically listed. Many omega-3 fortified eggs come from hens that were fed flaxseed or canola. Those eggs may be rich in omega-3s, but it will be mostly in the form of ALA, and not DHA and EPA. Another natural source of EPA and DHA is grass-fed meat (McAfee AJ et al, 2010). Cows, bison, and lamb that are allowed to feed naturally off the land, rather than being fed corn-rich diets (like most meat in our country), naturally accumulate less total body fat and have a higher content of EPA and DHA in their muscle tissues. Eating these meats also has been shown to improve the EPA and DHA blood content in humans. OK, so not everyone likes fish. Some people may be concerned about eating too many eggs. And some may not be able to afford eating grass-fed meat regularly. Luckily, many companies are now adding DHA to popular food items in an effort to improve our health —and increase their sales, of course, so read those labels first! When you go shopping, you might notice more and more foods with fortified with DHA. Foods orange juice and milk are popular items on store shelves these days. The DHA in many of these products come from algal oil (aka, algae), which has been shown in certain industry-funded investigations to be safe and poses no adverse effects (Fedorova-Dahms I et al, 2010). Research investigations have shown that algal oil does enrich tissues with DHA just as well as fish oil, and raises EPA slightly. The reason why these products focus on the DHA content rather than the EPA is because algal oil is rich in DHA. It also contains some EPA, though at a much lower dose than fish oil. Plus, DHA is considered to be a more potent brain nutrient. However, EPA is more beneficial for aiding in the prevention of mental illnesses and combating mood disorders (Ross BM et al, 2007). In other words, you may still need to look for other ways to get EPA in your diet. Other than fish rich in omega-3s, dietary supplements are usually the most efficient way to get EPA and DHA. Supplements containing oils from salmon, sardines, and krill are some of the most popular and effective sources. When choosing a fish or krill oil supplement, look for one that comes from a reputable company and has third-party testing to confirm low levels of mercury or other contaminants. If you’ve ever taken fish oil supplements and suffered from “fishy burps,” you’re probably a bit turned off from ever taking it again. If this is the case, try krill oil supplements, which are less likely to have this unpleasant after-effect. These recommendations are also given by large health organizations such as the National Academy of Sciences and the American Heart Association. Do your best to choose foods rich in EPA, DHA, and ALA as often as possible, and supplement with Omega-3 oils as regularly as you can – your body will thank you. Dietary eicosapentaenoic acid and docosahexaenoic acid are more effective than alpha-linolenic acid in improving insulin sensitivity in rats. Andersen G, Harnack K, Erbersdobler HF, Somoza V. Ann Nutr Metab. 2008;52(3):250-6. Epub 2008 Jun 19.
n-3 fatty acids and cardiovascular disease. Breslow JL. Am J Clin Nutr. 2006 Jun;83(6 Suppl):1477S-1482S. Effect of docosahexaenoic acid supplementation on the macular function of patients with Best vitelliform macular dystrophy: randomized clinical trial. Lee TK, Clandinin MT, Hébert M, MacDonald IM. Can J Ophthalmol. 2010 Oct;45(5):514-9. Efficiency of conversion of alpha-linolenic acid to long chain n-3 fatty acids in man. Brenna JT. Curr Opin Clin Nutr Metab Care 2002, 5(2):127-132. High-DHA eggs: feasibility as a means to enhance circulating DHA in mother and infant. Smuts CM, Borod E, Peeples JM, Carlson SE. Lipids. 2003 Apr;38(4):407-14. Omega-3 fatty acids as treatments for mental illness: which disorder and which fatty acid? Ross BM, Seguin J, Sieswerda LE. Lipids Health Dis. 2007 Sep 18;6:21. Review. Evaluation of the effect of omega-3 fatty acids in the treatment of premenstrual syndrome: “a pilot trial”. Sohrabi N, Kashanian M, Ghafoori SS, Malakouti SK. Complement Ther Med. 2013 Jun;21(3):141-6. doi: 10.1016/j.ctim.2012.12.008. Epub 2013 Jan 16.
n-3 polyunsaturated fatty acids prevent disruption of epithelial barrier function induced by proinflammatory cytokines. Li Q, Zhang Q, Wang M, Zhao S, Xu G, Li J. Mol Immunol. 2008 Mar;45(5):1356-65. Epub 2007 Oct 22. Omega-3 fatty acid supplementation increases anti-inflammatory cytokines and attenuates systemic disease sequelae in experimental pancreatitis. Foitzik T, Eibl G, Schneider P, Wenger FA, Jacobi CA, Buhr HJ. JPEN J Parenter Enteral Nutr. 2002 Nov-Dec;26(6):351-6. Food additives and hyperactive behaviour in 3-year-old and 8/9-year-old children in the community: a randomised, double-blinded, placebo-controlled trial. McCann D, Barrett A, Cooper A, Crumpler D, Dalen L, Grimshaw K, Kitchin E, Lok K, Porteous L, Prince E, Sonuga-Barke E, Warner JO, Stevenson J. Lancet. 2007 Nov 3;370(9598):1560-7. Erratum in: Lancet. 2007 Nov 3;370(9598):1542. Prenatal omega-3 fatty acids: review and recommendations. Jordan RG. J Midwifery Womens Health. 2010 Nov-Dec;55(6):520-8. Cardiovascular effects of marine omega-3 fatty acids. Saravanan P, Davidson NC, Schmidt EB, Calder PC. Lancet. 2010 Aug 14;376(9740):540-50. Epub 2010 Jul 15. Review. Omega-3 fatty acids in critical illness. Martin JM, Stapleton RD. Nutr Rev. 2010 Sep;68(9):531-41. Review. Limited effect of dietary saturated fat on plasma saturated fat in the context of a low carbohydrate diet. Forsythe CE, Phinney SD, Feinman RD, Volk BM, Freidenreich D, Quann E, Ballard K, Puglisi MJ, Maresh CM, Kraemer WJ, Bibus DM, Fernandez ML, Volek JS. Lipids. 2010 Oct;45(10):947-62. Epub 2010 Sep 7. Health benefits and potential risks related to consumption of fish or fish oil. Sidhu KS. Regul Toxicol Pharmacol. 2003 Dec;38(3):336-44. Safety considerations with omega-3 fatty acid therapy. Bays HE. Am J Cardiol. 2007 Mar 19;99(6A):35C-43C. Epub 2006 Nov 28. Review. Krill oil supplementation increases plasma concentrations of eicosapentaenoic and docosahexaenoic acids in overweight and obese men and women. Maki KC, Reeves MS, Farmer M, Griinari M, Berge K, Vik H, Hubacher R, Rains TM. Nutr Res. 2009 Sep;29(9):609-15.